We are all becoming aware of the importance of detoxing our bodies, but what about the importance of detoxing our minds? Deborah Marshall-Warren, a hypnotherapist practising in London, UK, offers you the opportunity to learn more in her book entitled Mind Detox, which is available now. Mind Detox teaches you how to boost confidence and well-being with powerful dialogue techniques that combine relaxation, contemplation, and creative visualisation. This allows you to get in touch with your ‘wise part’ – the part of you which is creative, energetic, successful, and loving – and make sure this ‘wise part’ turns up when you need it, responds positively to life, and generally helps you get what you want. Whatever you want to do , whether its build confidence, lose weight, face a tough public speaking engagement or give up smoking, Mind Detox lets you tap into your inner power and change your life. 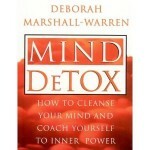 You can purchase Mind Detox from Amazon.co.uk. The book is also available on iTunes. A study of popular fears about hypnosis and why they are mistaken. This hypnotherapy book guides you through what is involved in hypnotherapy, using step-by-step examples of real hypnotherapy sessions. 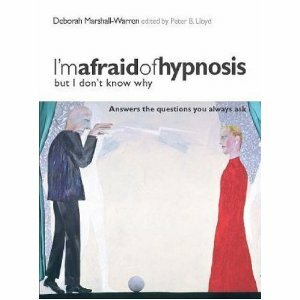 It also explores in the origins of popular misconceptions about hypnosis and hypnotherapy. Are afraid of hypnosis and don’t know why. Realise that stage hypnosis touches only the surface. Have questions both before and after their sessions. Feel a sense of something amiss in their otherwise successful lives. Want something positive, constructive, and specific, to change in their lives. Do not want to attend therapy week after week, year after year. Are about to wonder, ‘Why doesn’t everybody do this? You can purchase I’m Afraid of Hypnosis – But I Don’t Know Why from Amazon.co.uk. The spa industry is undergoing an unprecedented growth across the globe. More spas are opening each year, and many existing spas are expanding. This book is an exciting guide to joining the spa boom! If you are a therapist, a coach, or a beauty specialist, the world of spas is wide open and waiting for you! This guide is the key you need to open the door and get started on your journey to … a consultancy in the sun! The spa industry needs enthusiastic and experienced practitioners. Are you ready to join the gold rush? Golden beaches, golden sunshine, golden opportunities! 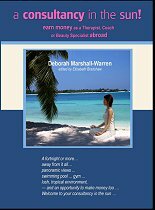 With a gentle mixture of common sense, wit and her own experience, Deborah Marshall- Warren takes you through choosing your adventure, preparing for it, fitting in, and gaining maximum benefit from it. A consultancy in the sun is not a holiday. It’s hard work in an unfamiliar setting. But you gain a lot of experience, self-confidence and new friends in the global village − and have a lot of enjoyment doing so. 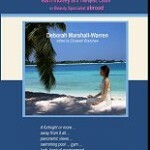 A Consultancy in the Sun is available from Deborah’s other website.